Just a quick post today to share a new idea I'm trying out in my classes this year. This year, I have tables instead of desks for the first time in my teaching career. 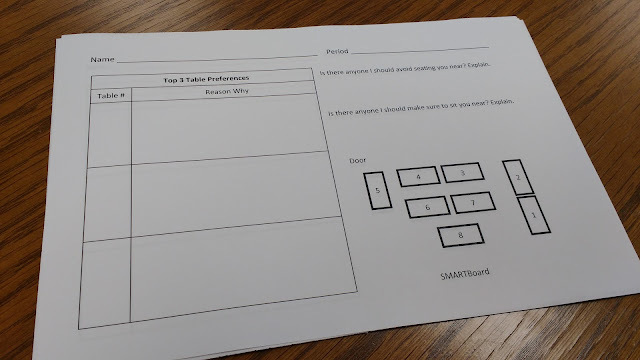 In preparation of making seating charts for the first nine weeks, I decided to give students a seating preference form. Students had to select their top three table preferences and give a reason why. I also asked them to note any students I should avoid seating them near or should make sure to set them near. Since I'm planning on keeping the same seating chart for the entire quarter, I'd like to hopefully not make my students mad at me for an entire quarter! Hopefully this form will help. Was this through your choice or was it already like this? Do you find the kids who look to the middle of the class prone to more unecessary chat? It's the only way the long skinny tables in my room will fit. So far, it hasn't been an issue. I'm interested in knowing how this worked out. Will you use it again this year? Any changes?